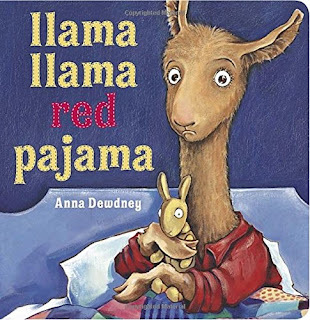 For Virtual Book Club for Kids this October we are spotlighting Llama Llama Red Pajama by Anne Dewdney! This week we hosted a pajama party themed preschool book club and had so much fun reading Llama Llama Red Pajama and playing a pajama matching game. We also did a few other activities that we'll share as well! 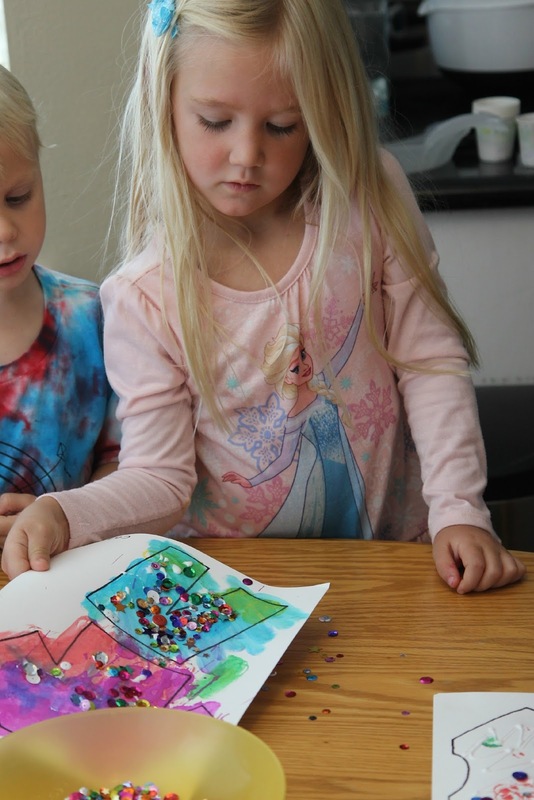 Preschoolers love their names and so we always try and incorporate a name hunt activity and name matching activity into each preschool book club. When kids are age 2 we focus on name recognition along with their photo. Once the majority of kids are age 3 we start working on name recognition without a photo! 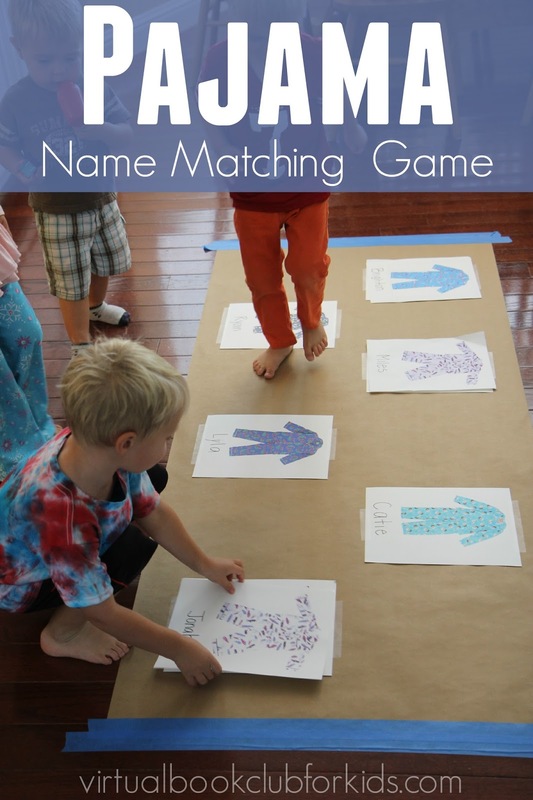 To create a pajama matching game board you need to first roll out some paper and secure it to the floor or wall. Next print out two copies of the pajama printables set. Write each child's name on a different pajama printable and then create a matching pajama card for them also with their name on it. Tape one pajama card onto the roll of paper and go and hide the other pajama card somewhere in your house. Have the kids hunt for the pajama printable that says their name on it! Once they've found the one with their name on it then they need to place it on top of the matching pajama card on the floor. All five of our preschool book club guests liked this activity but my littlest had a giant tantrum during the game because he wanted to find ALL of the pajama cards for everyone and they all wanted to find their own. Other than that, the game was a lot of fun!! I love hunting and matching games like this because it works on name recognition and visual discrimination and also gets kids talking about colors and other details on the pictures!! It is a great language activity! 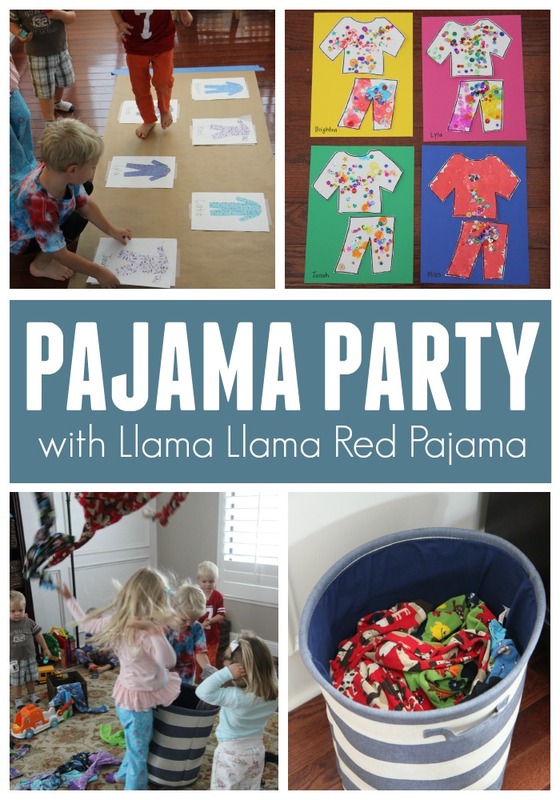 We also did several other fun pajama themed activities during our Llama Llama Pajama Party that you can check out below! 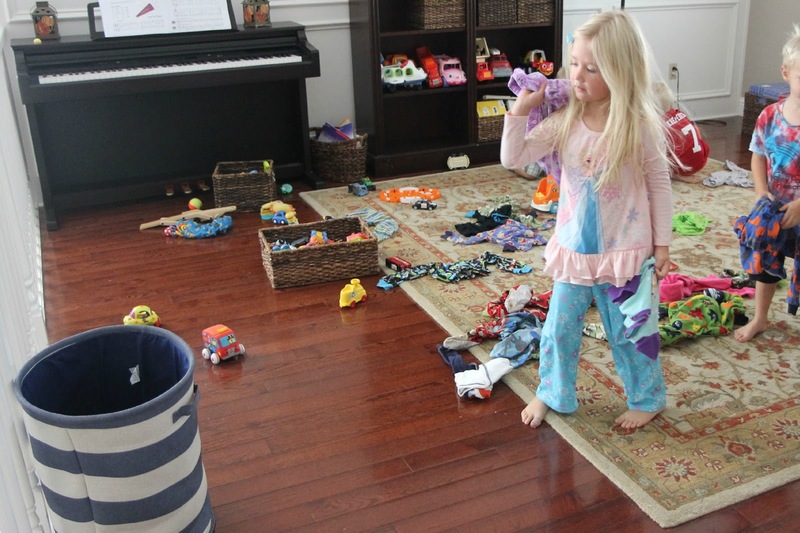 We started off by tossing pajamas all over our playroom and then we did a pajama pick up game! The kids especially loved dumping out the PJs when we were finished to play again! We also did a PJ toss game that was a big hit! The kids just each found a PJ top or bottom and then they lined up and took turns trying to make a basket in the laundry basket. 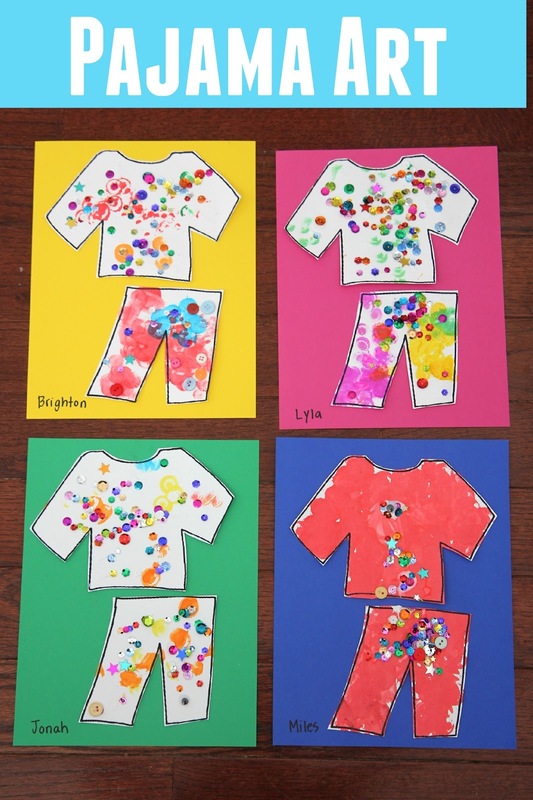 We also did some sparkly pajama art using our do-a-dot markers and a pajama template from The Best Kids Book Site. The kids started by painting their pajamas and then we let them dry... and then we were ready for embellishments! You can use any sort of embellishments that you like! After the kids decorated their pajamas then we let them dry... and then we decorated them with loads of sparkly stuff. I loved how we did this pajama art project in stages and played with toys for a bit... and then colored... and then played for a bit... and then cut, etc. That schedule definitely kept the kids interested for longer! In addition to doing all of these fun activities we also cuddled up with our favorite stuffed animals and blankets and pillows and read Llama Llama Red Pajama! What an adorable book! Have you ever read Llama Llama Red Pajama? This month we are spotlighting Llama Llama Red Pajama as part of our Virtual Book Club for Kids. Make sure to check out all of the book inspired ideas below created by my co-hosts!! I love the Pajama pick up! That is a great idea. I love the name matching activity - it's such a great way to start off a book club and get everyone knowing everyone else as well as some name practice. It looks like everyone had a great time. I've been wanting to do a preschool book club and this post is really encouraging to me to do it! These ideas are so fun! Thank you for sharing. My kids love Llama Llama books!